The Documentation tool can be used to create form wizards and outputs a document when the user has reach the end of the wizard. The Documentation Tool is fully responsive and works great on smaller screens as well as on your desktop. 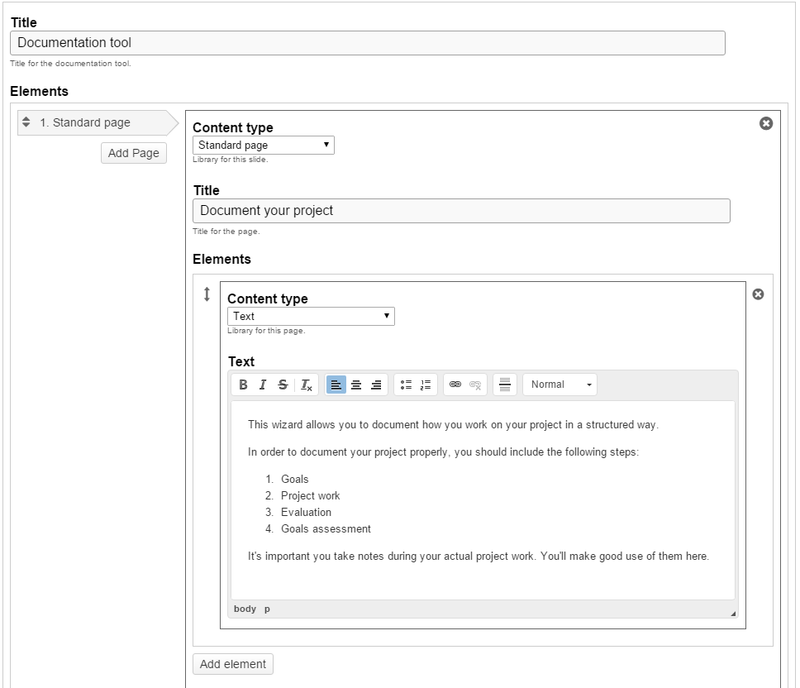 The Documentation Tool content type aims to make it ease creating assessment wizards for goal-driven activities. It can also be used as a form wizard. While editing, the author can add multiple steps to the wizard. In each step, the author can define which content goes into that step. 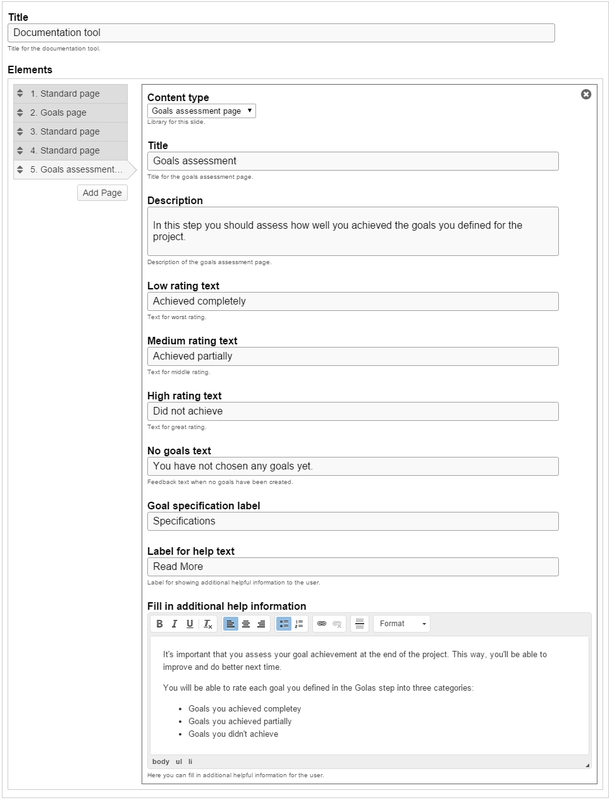 Content can be plain text, input fields, goals definition and goals assessment. Once published, the user will be taken through the steps of the wizard. On the last step of the wizard, the user can generate a document with all the input that has been submitted. This document can be downloaded. Navigate to the menu that enables you to create new content. In Drupal, you select Interactive content. 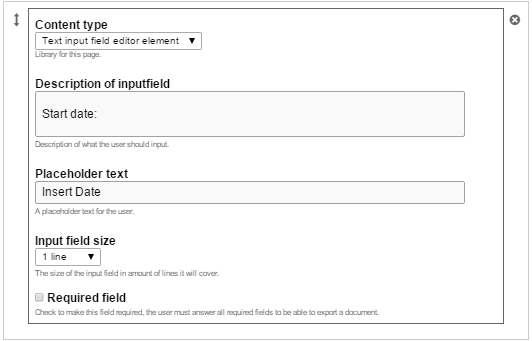 In WordPress, you press Add new under H5P Content in the admin menu. Select the Create option for H5P. If you find Documentation Tool in the list of Content types, skip to Step 1. You will now find Documentation Tool in the Content type list when creating a new H5P. There are four different types of elements which document how you work on your project in a structured way, so we'll add these following elements in upcoming steps. Head over to where you usually create new content on your platform. 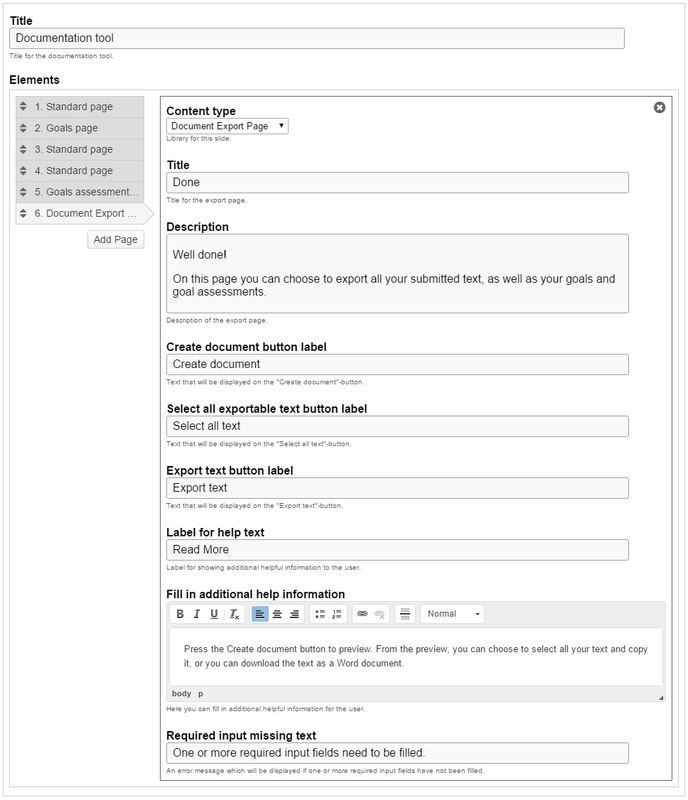 In Drupal, you go to Create content and select Interactive content. 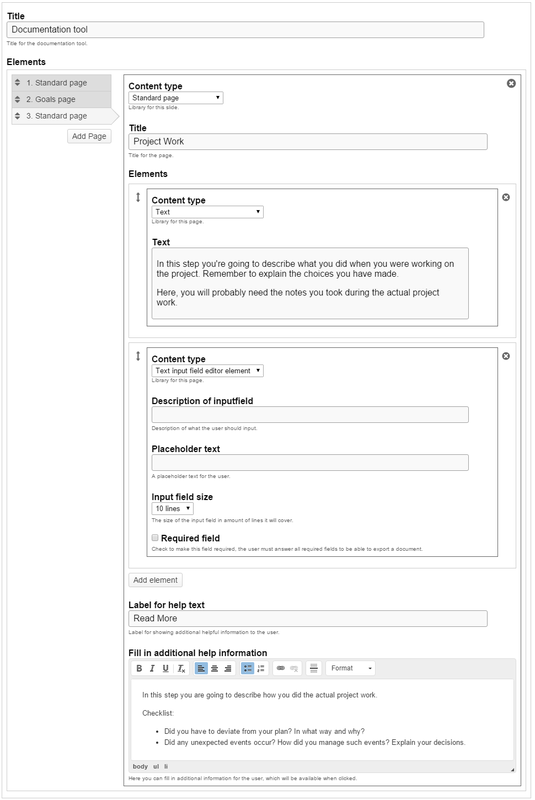 Then select the Create option for H5P and choose Documentation Tool from the Content type list. The Title will be displayed always throughout the tool even when you navigate to different pages. 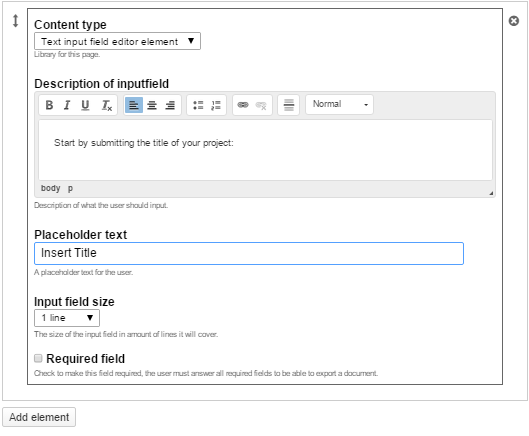 Type the following text in the Title field: "Document your project"
Save the node/article to view your finished Documentation Tool. You should now have the similar result as the example on top of this page. Hi! I´m a little sad (maybe confused haha) about this H5P plugin. I love how it helps guide the student in creating a document in a pre established format that the teacher has configured. Alas, I noticed the only way for the teacher to know his student has written in all the established blanks is for the student to export his document and I suppose email it or print it and show it to the professor. I propose (if it doesn´t exist, since I´m new to Moodle content) that there be an option for it to automatically save. Is that possible? Like it would be useful for the student to come back later on and respond other tabs he hasnt yet figured out. Even the goal assesment is strange to me since I think it´d be cooler if the student could write out his goals at the beginning of a course then work on his project over the course time and at the end do the self evaluation. So 1. An option for the student to save and continue editing later on on his project. 2. If there is any way the teacher can see what the student has worked on at any given moment throughout the course. Any comments on my comment? H5P has everythign needed to support 1 (the save content state features) and 2 (xAPI). Won't be a big job to add this, but nobody has been willing to work on it or fund it yet. Would make the tool a lot better! This is a bug as opposed to a feature request. As mentioned in an earlier comment the H5P Core and several content types supports saving the user state, however getting it into Documentation Tool will require some developer work. Understood. I have added it as a feature request. I'm not a developer/coder, so I'm afraid I can't help much other than to try and "vote it up"! Thanks for your quick response. Half a year later: Save still not working? This documentation tool seems useless to me as it is still not possible to save any goals and goals assesments. Is there anyone working on this? Afaik, there is no one working on this at the moment. If you have programming skills, you are welcome to create a pull request! As a general study aid or tool for students, this should work well, from personal learning plans to project process reporting and learning diaries and seems flexible ennough to be adapted to different schools of process thought, such as aims and objectives rather than the goals concept ;-). The state saving and other moderation capabilty features mentioned are indeed a very good idea to make this tool fully operational rather than just a more specific notepad tool. However, what I did not manage to acertain from the tutorial and comments, was whether it is possible to save the process / writing procedure constructed and reuse it, like a template perhaps, as a standard web tool for students on that course or performing a similar exercise / learning activity on other courses. It would not be practical to have to recreate the specific process for each student or give them a guide document for creating it themselves. 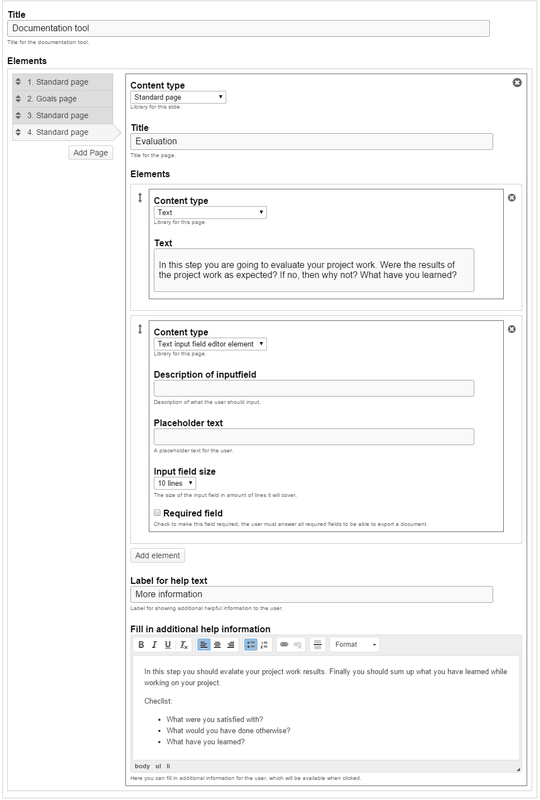 The tool and any specific instances (process templates) need to be available as a button selection option from a Tools / study resources menu in the main cms/lms as it should be from within H5P. In this way it can be made available as part of a learnining activity / resource centre from within a lesson or course at any point before, during or after the main course / lesson. An extension to this ideal functionality, is the facilitation of collaboration. Most project based learning activities involve more than one student, so the ability to cooperate, coordinate and collaborate on the project report writing is an important element. Full collaboration capability on the same piece of text / document would no doubt require revisioning and version control capabilities. They would also need the ability to post or expose the report to an port / dropbox for formal assessment, and/or to a portfolio/showroom for their group or on their individual blogs for peer review and promotion purposes, without having to print, scan or re-upload it. If these are already possible, please could you clarify for me - where and how this is done? ...If not, can it be added as a feature request please? There isn't any colaboration features yet. But there is a discussion on it here that you can join. is it possible to save the process / writing procedure created and reuse it, like a template perhaps, as a standard web tool for students on that course or performing a similar exercise / learning activity on other courses? 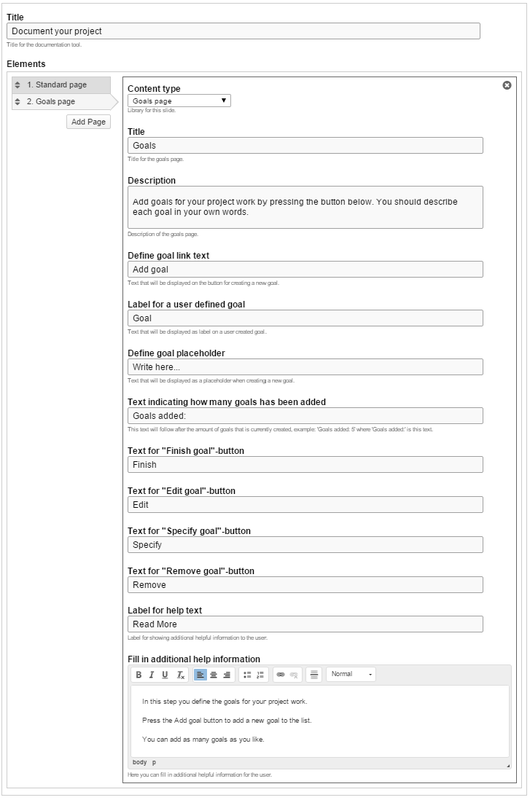 Do the Collaboration features, that you mentioned as under discussion, include the ability to post/export the eDocument to a bulletin board of peer review (e.g. blog page or discussion forum)? The requirement to make it readable with comments by other students for peer review purposes. Maybe you can use "Clone" on h5p.org to copy existing Documentation Tool content (like a template). (Or a similar thing on your on-premise system). Not sure. But let us know what you find out after you've experimented with it. are no real collaboration features yet. Only a discussion on the forum. 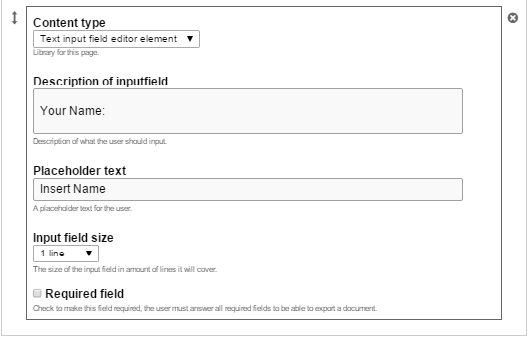 Use HTML in element type "text"
Wow this documentation plugin is just what I need! I will mainly be using "standard page", with the text element. Using on Wordpress. Has anyone been able to figure out how call the TinyMCE editor, or do HTML within the text field editor? I would love to add divs, tables or just paste in formatted code. Happy to hire out if you can point me at someone who knows how to do this. I believe it would be some work and frustration to try and add another WYSIWYG, but not impossible. h5peditor-html.js is the file that initiates the CKEditor, you could copy it and create your own widget or override/replace it entirely. Any HTML you add will automatically be stripped as each field has a whitelist of allowed HTML tags. Check out the WYSIWYG Text Editor Buttons guide to see how you can add to this list. Be warned that any extra tags you add may break the rendering of the UI as not all content types are designed to hold any kind of HTML. Using the documentation tool, some "sections" are longer than others. It seems h5p is using a height calculator script and seting the height of the iframe on page load. When switching to another section, anything longer than the initial height is cut off. See https://3aenglish.com/progress-update-heres-a-sneak-peak-at-what-you-can... for an example. This then changes once the browser window is resized, and all content is visible. Perhaps the file h5p > h5p-php-library > h5p-resizer.js is creating this? Anyone else experience a simlilar issue? Would it be possible to attach the H5P in this thread so that we can check it. I have a working example of the issue that can be found here. You can find the documetation tool at the bottom of the page, and I have set the h5p to allow downloads. If you click the last section "assessment" you will see the issue. Same issue duplicated. Had also tried disabling all plugins. One thing to note, I had created all of my documentation tools on a local machine, then uploaded. Potentially then updated to a new version after that (can't remember)? Hi, this was fixed for the release of Documentation Tool v.1.5.5 (see commit), please update your local version of Documentation Tool. Is there any way for the user to save their work and come back to it later when using the documentation tool? It's the key thing that is lacking and almost every user I have using it say's they need it. Is there a work around? Couldn't add any jpg/png images, no matter how big or small the resolution / file size. Are there any known issues using the Element Type: Image? I think it seems to be a permission problem on drupal / apache server since I can't upload any images even in other content types. Any advice? My Media > Files folder got sufficient permission. The log shows it attempted "POST /h5peditor/d6d2abee1dc9b/0/files HTTP/1.1"
It have vold been nice if the text also have been saved in the document when the wizard is finished. I think this is one of the most requested feature. This is one thread that talks about it. When I create a Documentation Tool project (in Moodle), the Submit button is not available on the page that appears after clicking "Create document." Your example shows Submit, Export text and Select all text along with the X for exiting. How do we get the submit button to appear? And, if we have the submit button, what is the function of that button? I created a separate post for this.